2012 was packed full of work. 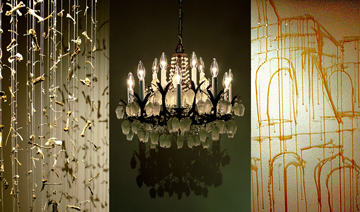 For the first half of the year my attention was focused on continuing to expand my "Jewel Net of Indra" installation. I've now painted 800 portraits. In the second half I curated two major exhibitions and 5 smaller ones for the World of Threads Festival, an international festival of contemporary fibre art in Oakville and Toronto. Along with Dawne Rudman, I've spent the last two years organizing Festival 2012. 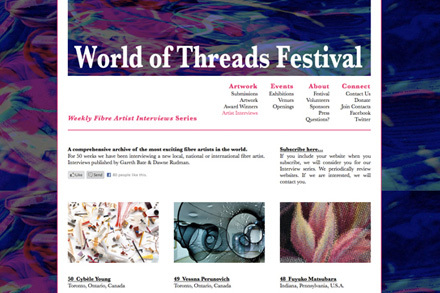 Over the year we published a total of 83 "Weekly Fibre Artist Interviews." This summer I took an art trip to Washington D.C, Boston, Cambridge and Concord and then spent a month in Prince Edward Island where I continued my six year "Cumulonimbus" photo series. 800 painted portraits for the Jewel Net of Indra installation. I have continued to expand my Jewel Net of Indra installation from the original 325 portraits to 800 as of Jan. 2013. It has developed into a major project that I'm committed to pursuing for the next four or five years. It has been the most engaging thing I've ever done. 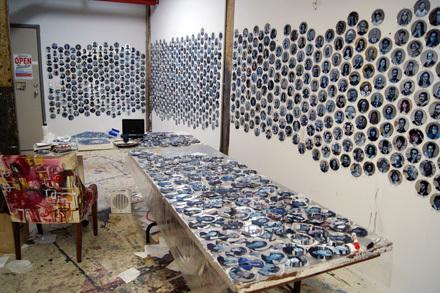 There are now finally enough portraits to place them on adjacent and opposite walls in order to achieve the infinite reflection or "many worlds" aspect of the piece which the original installation did not have. I've worked solidly on this piece, except for a six-month hiatus for curating the World of Threads. 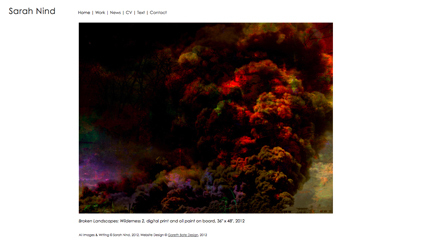 I was featured on "Studio Beat" a new website profiling artists in their studios. Read interview. 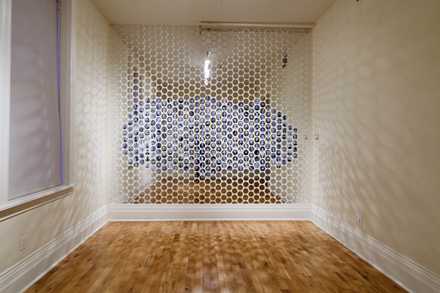 In January I presented the first version of the "Jewel Net of Indra" installation at The Gladstone Hotel's exhibition "Come Up To My Room." Since this show the piece has evolved significantly. Originally I positioned the portraits randomly, I'm now focused on creating thematic chronological connections between all the people. I have no plans to show the work any time soon until I've completed phase 2 which should take several years. See the List of Names and Artist Statement. Photo: Agata and Lucas Piskunowicz. I've been working on this series for 6 years now. Every August I stay at North Lake, Prince Edward Island and photograph the shifting skies over the lake in every weather condition. Every photograph is the exact same scene with radically different skies. I shoot hundreds of photographs over the course of the month, sometimes the sky changes completely within a few minutes. Photo: 2012 Cumulonibus 1, Gareth Bate,. North Lake, Prince Edward Island. 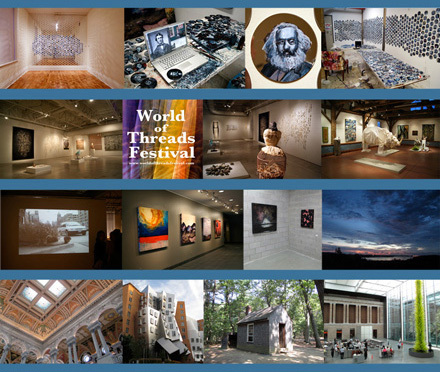 For the last two years I've been working as Festival Curator along with Dawne Rudman on the 2012 World of Threads Festival. This time we remained in Oakville where the Festival began, but also expanded into Toronto. Festival 2012 featured 195 artists from 12 countries and 8 Canadian provinces. I curated two of the major festival exhibitions and as well as five other smaller shows. It was a great success and attracted visitors from across southern Ontario as well other provinces, the USA and England. Festival: Nov 9 - Dec 2, 2012. Photo: World of Threads Festival Logo, Gareth Bate Design, 2009. For the 2012 World of Threads Festival I curated the exhibition "Memento mori" at The Gallery at Sheridan Institute in Oakville. This show was all about death, mortality, grief and the quest for immortality. I'd observed at trend in fibre art towards creating work that used the aesthetic or techniques of fibre, but was made from non-fibrous materials like stone, bronze, metal, wood, bark, ceramic, plastic, wire, solid paint and wax. The central question became why are these artists choosing to use fibre construction techniques, but replacing the fragility, impermanence and tactility of fibre materials with hard, 'permanent', and difficult to manipulate materials? A Memento mori is a reminder of the inevitability of death. Photo: Installation View: "Memento mori", Gareth Bate. 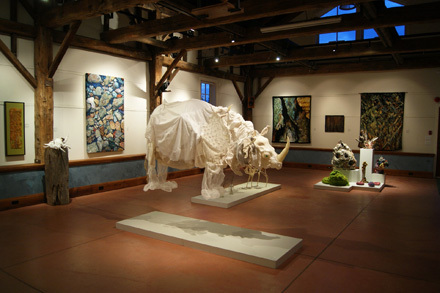 For the 2012 World of Threads Festival I curated the exhibition "De rerum natura (On The Nature of Things)" at Joshua Creek Heritage Art Centre in Oakville. The beautiful rural grounds were important for creating the mood and atmosphere for this exhibition which was all about plants, animals and nature. This highly eccentric exhibition evoked the collection of a mad 18th century naturalist. This lush and colourful environment was filled with bold and sometimes bizarre work. There were 35 artists from four countries. Photo: Installation View: "De rerum natura", Gareth Bate. I curated 5 smaller shows for the 2012 Festival. Four were co-curated with Dawne Rudman. Protrusion at Toronto's 401 Richmond St. W. featured four artists whose installations all protruded from the wall or from one floor to another. In Oakville the show Myth Making at The Display Area at Queen Elizabeth Park Community and Cultural Centre (QEPCCC) featured 3 artists dealing with mythology. Variegated Threads at QEPCCC was a variety of wall and installation work in the halls. The Outdoor Environmental Installations on the grounds of QEPCCC featured artists taking fibre outside. Fibre Collage at Abbozzo Gallery was a small show of collage work using fibre materials. Photo: Myth Making, Outdoor Environemental Installations and Protrusion. Every week for the last year, along with Dawne Rudman, I've published a new "Weekly Fibre Artist Interview". 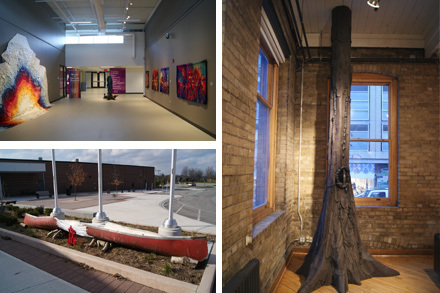 For 83 weeks we have been profiling local, national and international fibre artists. It has created a comprehensive archive of some of the most exciting fibre artists in the world. We have subscribers in 52 countries. 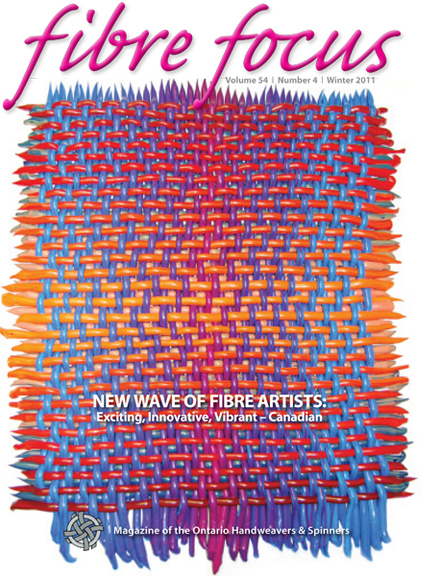 View "Weekly Fibre Artist Interviews" Archive. Where the Wild Things Aren't at Wall Space Gallery and Framing was an environmental themed exhibition curated by Cynthia Mykytyshyn in Ottawa, April - May, 2012. I showed my "Penance" performance with some very interesting other artists. Toronto Main Street at Main Street Warehouse, was a fun group show curated by Stefan Berg for Nuit Blanche in Sept. 2012. He took over an old warehouse and mounted an exhibition. The Gallery Opening for PUP Contemporary, was in Nov. 2012 and was curated by TEK. Photo: "Floating World" solo exhibition in Montreal, Gareth Bate. This summer I took a fabulous art trip and visited the amazing museums of Washington D.C. I visited The National Gallery, The Smithsonian Museums: Natural History, American Art, Hirshorn, Freer, Sackler, African Art, American Indian, Renwick, Corcoran and the Capital and Library of Congress and they were all FREE! Washington rivals New York for art museums. 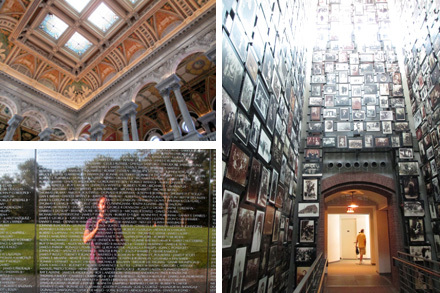 The stunning installation at the Holocaust Museum featuring photographs of all the murdered residents of a Lithuanian jewish town was particularly moving. I visited most of the memorials but the Vietnam Veterans Memorial designed by Maya Lin was a masterpiece and the only monument I've ever seen that actually triggered an emotional response. Photo: The Library of Congress, Vietnam Veterans Memorial the Holocaust Museum in Washington D.C, Gareth Bate. The next stop was Boston. I stayed in Cambridge. The Isabella Stewart Gardner Museum was a real treat. This mansion turned art museum is preserved in its exact original curatoral condition. The Boston Museum of Fine Art is fantastic and filled with famous work. I particularly liked the modern and Mayan sections. I also enjoyed the Institute of Contemporary Art. A highlight of the trip was the Mapparium at the Mary Baker Eddy Library, a room in the form of giant lit up globe. 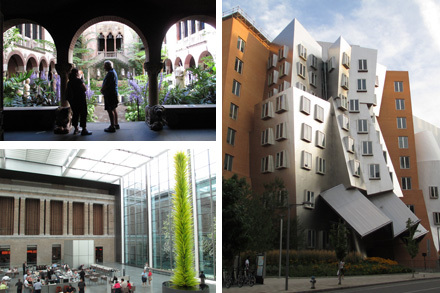 I saw the Frank Gehry designed Stata Centre at MIT. I absolutely loved Cambridge Massachusetts and wondering around Harvard University. I visited the Harvard Museum of Natural History and was blown away by The Harvard Glass Flowers collection. The 3000 models were created by German father and son team Leopold and Rudolph Blaschka. They started in 1886 and spent five decades creating the 830 plants. My first impression was just being stunned that such a room could even exist, that anyone could have made these. Then you start to grasp that they are all made of glass! The intricate subtlety of them is what’s so remarkable. While there, I thought that there is no better way to spend a life." Photo: The Harvard Glass Flowers, Gareth Bate. I went on a pilgrimage to visit Walden Pond the site where transcendentalist Henry David Thoreau built his cabin and wrote Walden. It was such a beautiful place despite being a bit spoilt by the loud family beach. It’s hard to say what I love so much about Walden. It is a philosophy book in the disguise of a personal journal. I find his observations about politics, society and nature very compelling. I also now know that Concord is pronounced "conquered" and Thoreau is pronounced "thorough." Photo: Thoreau's Cabin at Walden Pond in Concord, Gareth Bate. Updates to my website "Inspirations" page. I've added several new things including Christian Marclay's "The Clock" which I think is the greatest thing ever. This epic 24-hour film pieces together clips from the history of film to create a giant multi-layered experience of time. 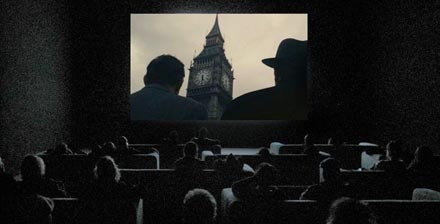 Every scene in the film is either a moment in a film that features a clock, or discussion of time. I’ve seen 8 hours of it, from 2:00 to 5:20 am and 10:30 am to 3:00 pm at The Power Plant in Toronto." Photo: "The Clock", Christian Marclay, The Powerplant, Toronto. I continue to teach three courses at Central Technical School's adult night school program. Learn more about my classes in my new website section "Teaching." This informal lecture style course is intended to make students feel comfortable discussing modern and contemporary art from 1850 - present. Through looking at art books and powerpoint presentations we discuss important artists and movements such as Impressionism, Cubism, Dada, Surrealism, Abstract Expressionism, Pop, Land Art, Conceptual, Post-Modernism, Performance, and Contemporary Art etc. Projects follow the evolution of abstract art over the last century. Explore Abstract Expressionism through colour-field and geometric painting and post-modern approaches. Students look at historic and contemporary artists from Picasso to Pollock to Mehretu. 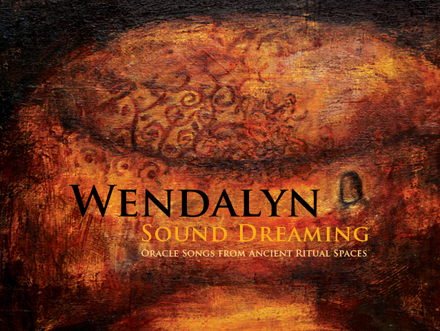 Photo: Album design for Wendalyn "Sound Dreaming" by Gareth Bate Design, 2012. K.M. Hunter Charitable Foundation, Sarah Nind, Nancy Kembry, Viniyoga Connection, Jane Adams Consulting, Janet Hunter. World of Threads Festival I did all the design for the 2012 Festival including the brochure graphics design, website and signage. My article "10 Up and Coming Canadian Fibre Artists to Watch" was published in two parts in the winter and spring editions of Fibre Focus Magazine. It profiled ten artists I've encountered while organizing the World of Threads Festival and publishing the "Weekly Fibre Artist Interviews" series. ALMOST NOTHING! For the first time ever I'm thrilled to say that I have only two shows planned for 2013. After a crazy 2012 packed with far too much, and a lot of emphasis on curating, I'm going to focus my attention entirely on my own work and the continuation of the Jewel Net of Indra installation. My hope is to reach 2000 portraits by the end of the year. Gareth Bate Art Projects, 401 Richmond St. West. A three person environmental show with Karen Abel, Gareth Bate and Jessica Marion Barr. Curated by Jessica Marion Barr. Each artist is dealing with a different "indicator" species whose traumas indicate much broader environemental problems. I will be reviving my honey drawings for this immersive installation.